#696 PIWIGO API - pwg.categories.delete doesn't work properly. Design matters. This is what recent user testing sessions have clearly revealed. This is why this version 2.9 focuses on refreshing our design, for the administration pages. Of course we have also added a few features, improved ergonomy and made your Piwigo even faster. A few weeks after its 15th birthday, Piwigo releases its version 2.9. Happy update! 8 March 2016 - 30MBAfter more than a year without major change and a move to Github, Piwigo comes back with version 2.8 and awesome new features. Authentication keys in notification emails will make life easier for your users. Multiple format feature extends the possibilities of use for companies and pro photographers. Compatibility with PHP 7 marks our commitment to the future. We hope you'll love this new version! 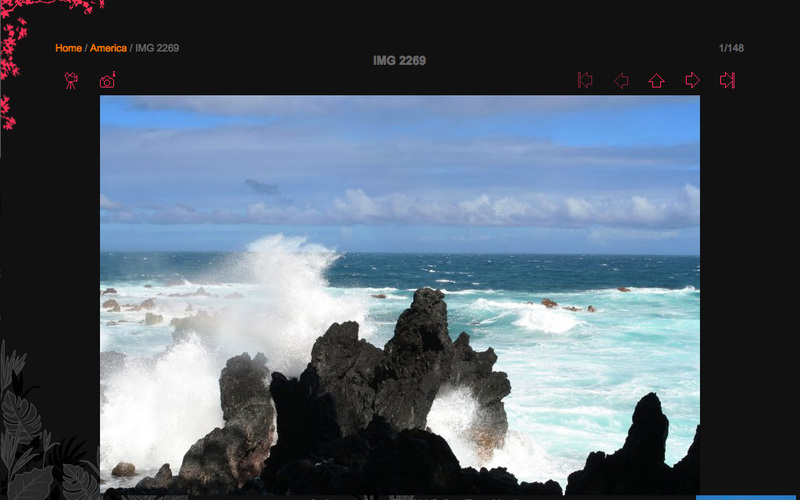 0003159: [upload] Internet Explorer 11, wrong link on "Add another set of photos"
24 September 2014 - 30MBVersion 2.7 features many major improvements. We hope you'll love them as much as we do! The web upload form has been rewritten from scratch. A new plugin "Take a Tour" offers interactive tours within your own Piwigo. Search features have been extensively enhanced. 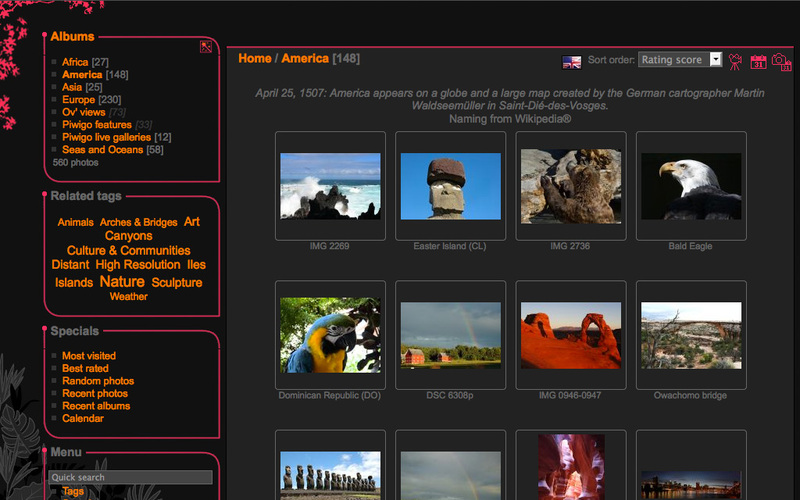 Owners of large photo galleries will appreciate speed improvements. Plugin developers will discover many new technical features. 17 January 2014 - 30MBVersion 2.6 introduces new features for users, especially administrators. The mobile theme now has important improvements. The user manager has been redesigned from scratch. 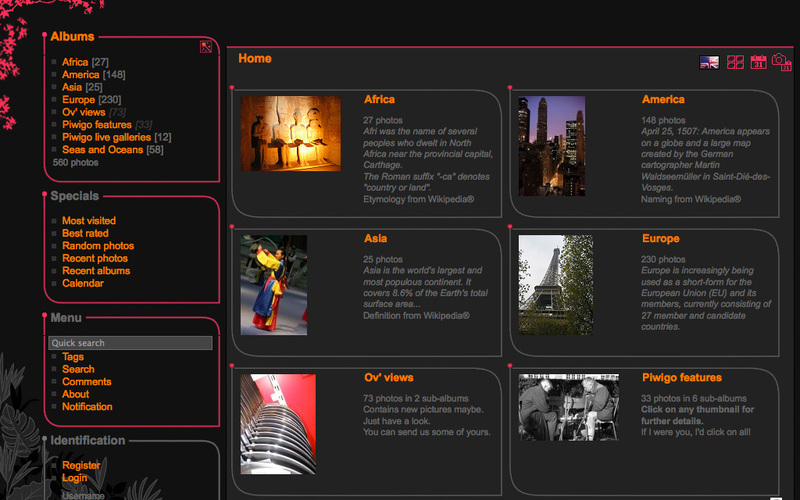 The new plugin "Admin Tools" will let you edit albums and photos from the gallery. A new mail system presents clean graphical themes and a robust engine. Version 2.6 also introduces technical features including simpler coding for plugin creators. 20 languages have been updated: Afrikaans, Bulgarian (Български), Esperanto, Argentina, Estonian (eesti), French Canadian (Québecois), Italian (Italiano), Kannada (ಕನ್ನಡ), Korean (한국어), Lithuanian (Lietuvių), Mongolian (Монгол хэл), Malaysian (Malay), Portuguese Brazil (Português Brasil), Romanian (Română), Russian (Русский), Slovenian (Slovenščina), Swedish (Svenska), Tamil (தமிழ்), Hong-Kong (中文香港), Traditional Chinese (中文 繁體). New language: Mongolian (Монгол хэл). 0002881: [web API] [pwg.images.addSimple] undefined constant tags-assumed "tags"
5 March 2013 - 30MBVersion 2.5 brings both functionnal and technical changes, from new icons to group manager, including external authentication such as OpenID or Wordpress.com. Piwigo 2.5 in numbers: 30+ new features, 900+ code changes performed by 7 developers and 100+ translators, 4 new languages expanding Piwigo to 51 languages out of the box, 8 months of preparation. 0002797: [template] local css for "clear" impacts admin theme "clear"